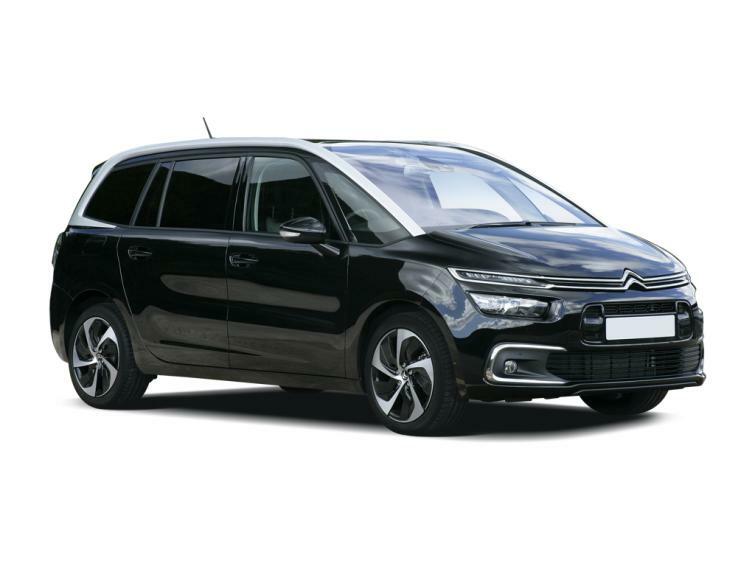 Once known as the Citroen Grand C4 Picasso, this seven-seat people carrier has now been renamed, but still offers a class-leading combination of comfort, practicality and value-for-money, particularly as a used car. The narrow lights and curved bonnet of the Grand C4 SpaceTourer can’t quite disguise its minibus-shape, but you benefit from its bulkiness inside, where there’s plenty of headroom and lots of storage space. You’ll fit three adults across the middle row in relative comfort, and if your child seats are narrow enough, then you can also fit three abreast too, thanks to a trio of Isofix mounting points. Rear air vents, power sockets, optional window blinds and airline-style folding tables (on top-specification cars) help to keep rear occupants comfortable. Legroom is rather more limited in the rear row, where the two seats are more suitable for children. In all but entry-level cars, the middle seats slide back and forth so you can increase and decrease the space for passengers in both rows. Pick a Volkswagen Touran for a roomier back row. Don’t expect much boot space when all seven seats are in use - you’ll need a full-size Ford Galaxy, Seat Alhambra or the larger Citroen SpaceTourer for that. But with fewer passengers, the rear two seats fold flat into the floor, opening up at least 632 litres of space, which almost matches a Skoda Superb Estate. It’s a fiddly operation that’s much simpler in the VW Touran - which also has a bigger boot. It can’t match the Citroen’s van-like capacity of 2181 litres when all rear seats are folded, though. Like the smaller five-seat C4 SpaceTourer, the car's dashboard has a minimalist look, without even a display behind the steering wheel or ventilation controls. Virtually everything is controlled through a 7in touchscreen and a second display, which includes a digital speedometer. This is a 12in widescreen in all but entry-level cars. Having to adjust the temperature with a series of prods, rather than the quick turn of a dial, is fiddly. A rotary dial for other functions would also be easier to use on the move but the system, on the whole is quick to respond and clear. There’s also Apple CarPlay and Android Auto across the range, enabling you to use your phone apps for music, navigation and hands-free calls. New cars start at around £23,500 before discounts, which is more expensive than the Vauxhall Zafira Tourer but cheaper than other seven-seat people carriers, such as the Ford S-Max, VW Touran and Renault Grand Scenic (just). The price difference is even greater on the used market (search for the earlier Grand C4 Picasso for the widest choice), where the Citroen is a real bargain. You might see it as less stylish than a tall and rugged-looking sport-utility vehicle (SUV), such as the Skoda Kodiaq, Peugeot 5008 and Land Rover Discovery Sport, but it costs considerably less - again that’s especially true if you’re looking at used cars. The pricing is particularly impressive when you consider that standard equipment includes climate control, rear parking sensors, plus automatic lights and windscreen wipers. The Grand C4 SpaceTourer is designed for comfort, gliding smoothly over rough roads. Steering is light, making parking simple, but it can make it hard to judge how much you need to turn the wheel in corners. It encourages a leisurely driving style, which is just as well because the car will lean uncomfortably if you take corners too quickly. The Ford S-Max, Volkswagen Touran or Renault Grand Scenic are more stable in this situation, with greater agility when changing direction. The Citroen is generally quiet, although you notice road noise in the background at motorway speeds, and the most powerful diesel engine (which will shortly be discontinued) is rattly. It's cheap and economical on paper, but this version feels sluggish and its real-world fuel economy of around 50mpg isn't much better than the more powerful BlueHDI 120. Reasonable acceleration and fuel economy (you can realistically expect 40mpg) make this petrol-powered Grand C4 Picasso a surprisingly good choice. It's well-suited to regular short journeys that can cause problems for diesel engines. Feel trim includes a second colour display with sat-nav for clear information, and sliding rear seats for extra flexibility. Only available in top-of-the-range Flair trim, the most powerful diesel engine offers slightly more performance than the BlueHDi 120 model, but the difference isn't that noticeable. It's best bought as a used car because it's expensive when new and loses value fast. Even though this is the most economical Grand C4 SpaceTourer you can buy, the BlueHDi 100 diesel engine is slow, and will leave you dawdling as you join motorways or attempt to overtake. May 2018 The Citroen Grand C4 SpaceTourer replaced the Grand C4 Picasso. The cars are virtually identical but automatic emergency braking is added as standard to Flair trim. Engines badged BlueHDi are diesel-powered; PureTech and THP labels indicate a petrol engine. The larger the number, the more powerful the engine is. All models feature Start & Stop (S&S), so the engines will turn off automatically when you stop - at traffic lights, for example. Automatic gearboxes are called EAT, which stands for Efficient Automatic Transmission. EAT6 versions have six gears, while the EAT8 is more efficient, thanks to its eight gears. The cheapest brand new Grand C4 SpaceTourer comes with a petrol engine, a small 1.2-litre motor, badged PureTech 120, which is surprisingly effective at powering such a large car. Real-world fuel economy (as opposed to the unrealistic official figures) should be around 40mpg. But most versions of the car are likely to be chosen with a diesel engine, so more of these will be available on the used market. It’s best to skip the underpowered BlueHDi 100 in favour of the nippier BlueHDi 120, which offers virtually the same fuel economy (around 50mpg in the real world), and reasonable acceleration at all legal speeds. There’s an automatic and manual option. The BlueHDi 150 provides extra thrust for overtaking manoeuvres if you can put up with more noise from under the bonnet, but it’s due to be replaced this summer with a more powerful BlueHDi 160 model, which comes with a new eight-speed automatic gearbox that’s claimed to be smoother and more efficient than the six-speed automatic offered with the rest of the range. For maximum power, Citroen offers the petrol THP 165 engine. Acceleration is no more than brisk, but fuel economy is little worse than the smaller petrol motor. Choose the trim level for your Citroen C4 SpaceTourer carefully because many features can’t be fitted to cheaper versions: you won’t find any front parking sensors or panoramic sunroofs on the entry-level Touch Edition cars - even as options - for example. That said, even these cheapest Touch Edition cars include plenty of equipment, including climate control, rear parking sensors, automatic headlights and windscreen wipers, 16in alloy wheels and Isofix mounts on the three seats in the middle of the car. They also have a 7in touchscreen in the dashboard, which you use to adjust the temperature, as well as controlling the radio and any connected phone. Apple CarPlay and Android Auto software is installed, enabling you to control certain apps, including navigation and messages, using the touchscreen or voice control. Above this, Touch Edition models have a black and white screen with the speedometer. On higher-specification Feel cars, this second display is a 12in widescreen, which can be customised to show a variety of data, including information about currently-playing music, or directions from the sat-nav. Traffic information, fuel prices and weather conditions are all displayed. Front seats gain a massage function, while a sliding function is added to rear seats. Outside, larger 17in alloy wheels are included, while additional options - not available on the cheaper car - include a panoramic sunroof and automatic emergency braking. At the top of the range are Flair cars, which include the automatic emergency braking and blind spot alert as standard, as well as the panoramic sunroof. Other equipment included in the price is a reversing camera, self-parking function and part-leather seats. A keyless entry and start system includes the ability to open the motorised bootlid by poking your foot underneath the back bumper. Rear passengers gain window blinds and fold-down tray tables. Citroen doesn’t get much joy from reliability surveys: the manufacturer was ranked a lowly 24 out of 26 in this year’s Auto Express Driver Power survey, with around 15% of new car owners reporting a problem. In general, the most common issues tended to be electrical, affecting the cars’ technology and not necessarily leaving them stranded at the side of the road. New cars are covered by a three year warranty that’s limited to the first 60,000 miles and this is transferred to subsequent owners until it expires. There’s also a fixed-price menu of parts if anything needs replacing on a car that’s less than three years old. This should help to keep any repair bills under control. The Grand C4 SpaceTourer drops sharply in value as soon as it hits the road, so nearly new cars can bring excellent savings. If you’re looking for an even cheaper used car, however, then you’ll need to search for the Citroen Grand C4 Picasso. The car’s name was changed in May this year but little else was altered, so it’s basically the same vehicle. Models sold after September 2016 are worth looking for, if your budget allows, as most will have updated technology, included a much more responsive dashboard screen and Apple CarPlay or Android Auto. Beware of some older models which were held in stock and sold after this date. The Citroen Grand C4 SpaceTourer is the replacement to the Grand C4 Picasso and looks no different to its predecessor (pictured). The seven-seat Citroen Grand C4 SpaceTourer has a boxy rear end to accommodate a third row of seats. The smaller C4 SpaceTourer is curvier. All Citroen Grand C4 SpaceTourer cars come with alloy wheels. The 18in "Python" design pictured are standard on top-of-the-range Flair models. The Citroen Grand C4 SpaceTourer's dashboard is dominated by a dual-screen dashboard display. Even the speedometer is contained in the upper screen, rather than behind the steering wheel. Apple Carplay and Android Auto are standard on the lower dashboard screen of the Citroen Grand C4 SpaceTourer. The upper colour screen is standard on all but entry-level Touch Edition cars. Luggage space is extremely limited when all seven seats are being used in the Citroen Grand C4 SpaceTourer. But when both rear rows are folded, you've virtually got a van.